Aspose.Words for Cloud, a cloud-based document creation, manipulation and conversion API, helps you process documents with its many flexible features. You can perform a wide variety of document operations with Aspose.Words for Cloud’s REST API. Create a new document from scratch, modify an existing document, convert documents to different formats, and render the document to images. Aspose.Words for Cloud’s platform independent document manipulation API is a true REST API that can be used with any language: .NET, Java, PHP, Ruby, Rails, Python, jQuery and many more. You can use it with any platform — web, desktop, mobile, and cloud. The API integrates with other cloud services to give you the flexibility you need when processing documents. It is suitable for any type of business, document, or content. 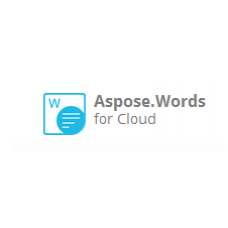 Aspose.Words for Cloud supports the popular word processing (DOC, DOCX, RTF, OOXML) PDF, XPS, EPUB, HTML, XML, TXT, DOT, ODT, OTT, DOCM, DOTM, EMF, SWF and other image file formats (PNG, BMP, JPG, SVG, TIFF) that your business depends on. Most of the businesses require to render documents to different image formats. In order to render documents to images, you need an API which can produce high fidelity images. You can trust Aspose.Words for Cloud API while rendering your documents to images, because it produces high quality images in a variety of formats. You can easily use Aspose.Words for Cloud as a fully featured reporting solution. Design your reports in Microsoft Word and then allow Aspose.Words for Cloud to populate documents with data from XML data sources. Aspose.Words for Cloud allows developers to use standard Microsoft Word mail merge fields in reports. Additionally, you can use the Aspose.Words for Cloud extended syntax for mail merge fields to perform more complex operations during mail merge operations such as inserting images or repeatable regions. In addition to text and images, there are many elements which make up a document. These elements include annotations, bookmarks, tables, hyperlinks etc. In addition to these elements, a document may contain different types of shapes. Aspose.Words for Cloud API allows you manipulate text, images, of these and many other document objects. All the operations on these elements can be performed with the help of simple REST based interface in the cloud. This API also helps you to work with page number, header/footer and mail merge fields as well as watermark. This API also provides you the method to work with document properties. Aspose.Words for Cloud provides you the functionality to convert documents (DOC, DOCX, ODT, RTF etc.) to different other file formats. These conversions can be performed with the help of a simple REST API method. Aspose.Words for Cloud makes sure that the converted documents are produced according to the target file's standards and can be opened with the native tools.